Well made and fit perfect! 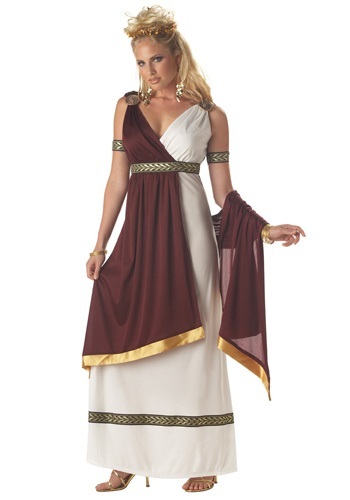 Perfect for senior toga day! My daughter loved it! I would have preferred if it were same colour as in the photo though. I am a size 12-14 dress size. I ordered the XL but really could wear the large. Very nicely made. I like that the back of the dress is the burgundy color so it is not see thru and the material is not cheap or night gown material. I recommend this costume. Received in time. Good quality and exact size. Fit me perfectly, pretty good quality. Got it a year ago and it's still hanging in there. The white parts are slightly see-though and I couldn't pin on the medallions for the life of me. But it I still got a lot of compliments on it.